Nouveau Plan des Environs de Paris d'apres les Nouvelles Observations de M.M. de l'Academie Rle. Des Sciences. 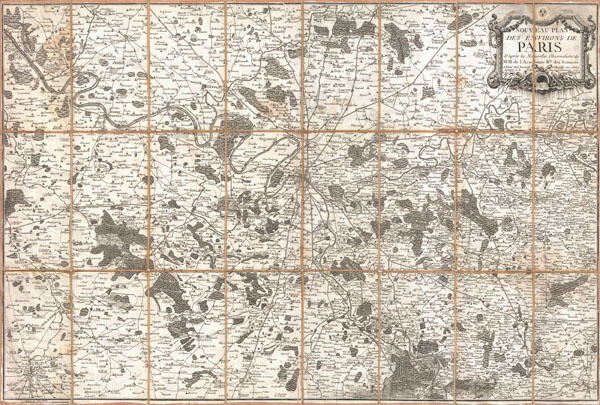 A stunning 1775 pocket map of the environs of Paris, France by the firm of Esnauts & Rapilly. Covers the greater Paris area from Chartres in the southwest to La Ferte in the northeast and from Vernon in the northwest to Bray in the southeast. Offers incredible detail throughout naming numerous estates, palaces, forests, churches, monasteries, fortifications, and other geographical features. A large baroque title cartouche appears in the upper right quadrant displaying garlands and a fountain. We believe this to be the first edition of this highly uncommon map. Very good. Original linen backing in excellent conditon. A couple of mkinor discolorations here and there, else clean. Deutsches Historisches Museum, Do 2006/347.